I quit sugar since Christmas, yeah...I know what you're thinking right now: "dude, she runs a dessert blog what the hell is she thinking? Is she going to publish 'hippie' food from now on?". Calm down people, it's not that I'm giving up on sugar entirely...I just wanted to 'behave' since I ate quite a lot of sweet treats during the holidays (comparing to what I usually eat on normal days). That lead me to some heartburn symptoms for a week or so, and then I decided to eat more clean, more fresh, more raw and to cut back on sugar and some oily, saucy foods. My stomach is so used to eat healthy and clean that when I try again the 'bad stuff' my body rapidly sends me a warning message...and let me tell you something, I'm feeling more energized, less foggy and my stomach is happy again. So during the last month I haven't tasted any refined sugar, not even whole cane sugar, only coconut sugar and maple syrup to sweeten up my morning pancakes, porridges and my bakes. These pear and walnut muffins I'm sharing with you today are sweetened with natural applesauce and pure maple syrup and they taste so deliciously good! 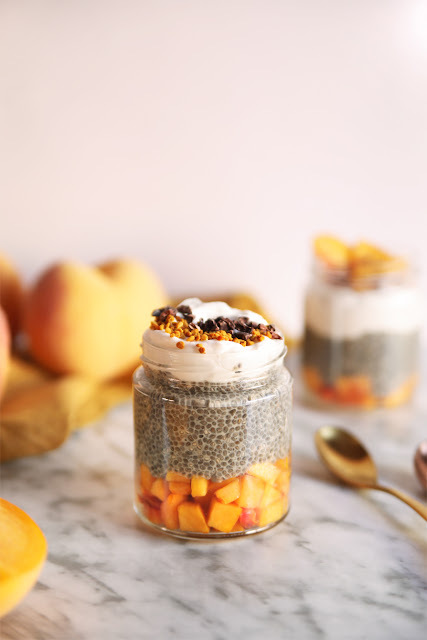 They have the right dose of sweetness and make the perfect breakfast or afternoon snack without feeling those sugar spikes, or when you want to treat yourself with something sweet yet good for you. Also these are quite probably the fluffiest and lightest muffins I've ever baked, they are like really REALLY tender and soft; so much that I recommend having a fork on hand cause you'll want to eat even the tiniest crumb. I'm thinking right now about the banana chips + dark chocolate chunks-combo...pretty sure it will work very well in this recipe.Of course I'll let you know as soon as I try it! 1/2 cup plus 2 tbsp brown rice flour. 1/2 cup sprouted spelt flour. 1/2 cup plus 1/2 tbsp almond meal. 1/2 cup pear chunks (1 pear approx.). 1 Rocha pear, cut in thin slices to decorate. - About the almond milk: I always recommend to read the labels because not all the milks have the same percentage of almonds. Some brands taste like meh-sweet water because they have a lot of water, sugar/sweeteners and thickeners but a little amount of almonds. I recommend you to compare different brands and buy the one that has the higher percentage of almonds in your store. - You can use regular spelt flour instead of sprouted spelt flour. 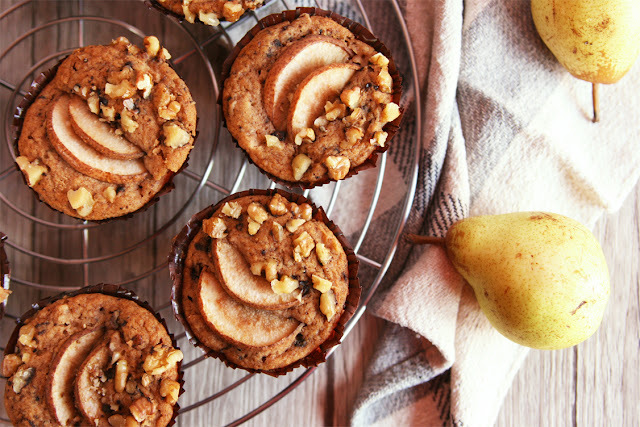 - I recommend using Rocha pears for this recipe (it's a portuguese variety). 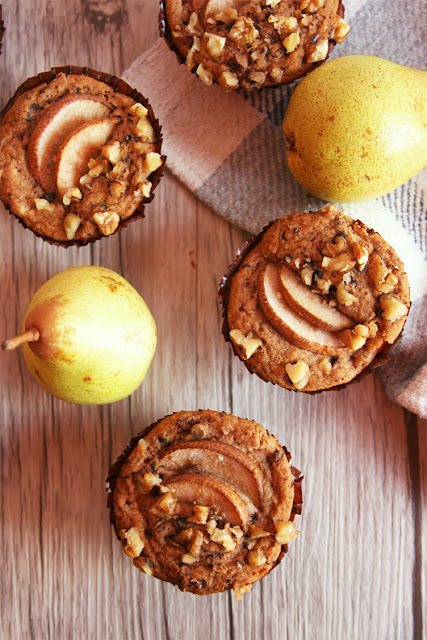 It's a crunchy, nutty pear that is more resistant to handling and easier to cut into thin slices. 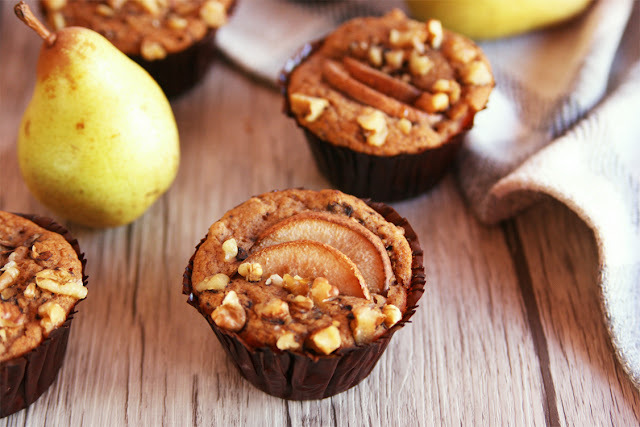 To get 1/2 cup of pear chunks you'll need one Rocha pear approximately, to decorate the top of each muffin you'll need a second pear. In a small mixing bowl whisk together the apple cider vinegar and almond milk, set aside until the milk curdles, approximately 7 minutes. Meanwhile preaheat the oven to 170 ºC (338 ºF) and line a muffin tin with 8 paper liners. In a large mixing bowl mix the flours (brown rice and spelt), the almond meal, ground flaxseeds, baking powder, soda and spices. Chop the pear into small chunks and add them to the dry mixture along with 1/2 cup of the chopped walnuts. Reserve the remaining 1/4 cup of walnuts to decorate the tops. In a medium bowl whisk the olive, applesauce and maple syrup until combined. Add in the milk/vinegar mixture and mix well. Finally pour this wet mixture into the dry ingredients and mix well with a silicone spatula until thoroughly combined. 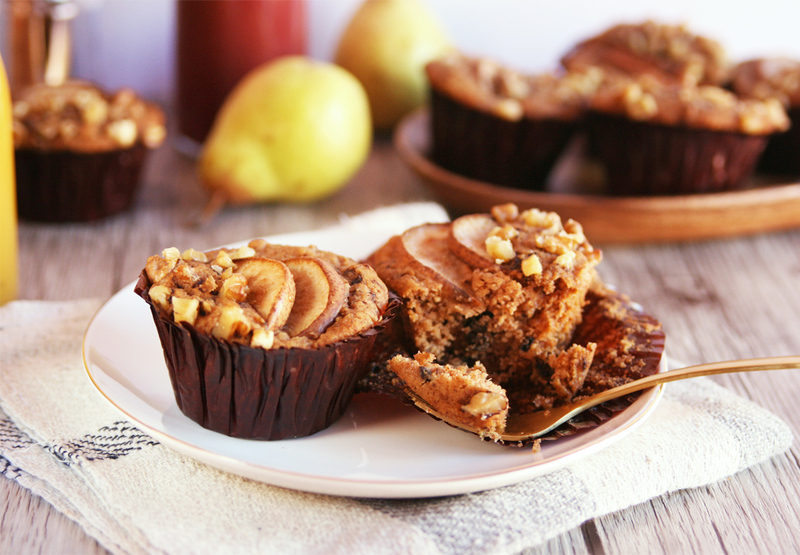 Fill each muffin cup with the batter and decorate the tops with two slices of pear per muffin and the rest of the chopped walnuts (1/4 cup). Bake for 25-30 minutes or until a toothpick inserted into the center of one muffin comes out clean. Brush the tops with a bit of maple syrup while they are still warm (optional). 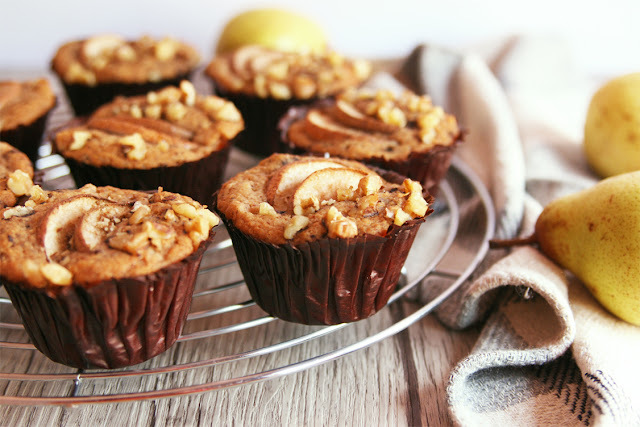 These Pear and walnut muffins look incredible and apple sauce and maple syrup sound like a delicious alternative to sugar I bet they taste amazing. As a hopeless sugar addict, I applaud your efforts and ability to make such compelling sweet treats even without the white stuff! Your muffins look both beautiful and delicious... 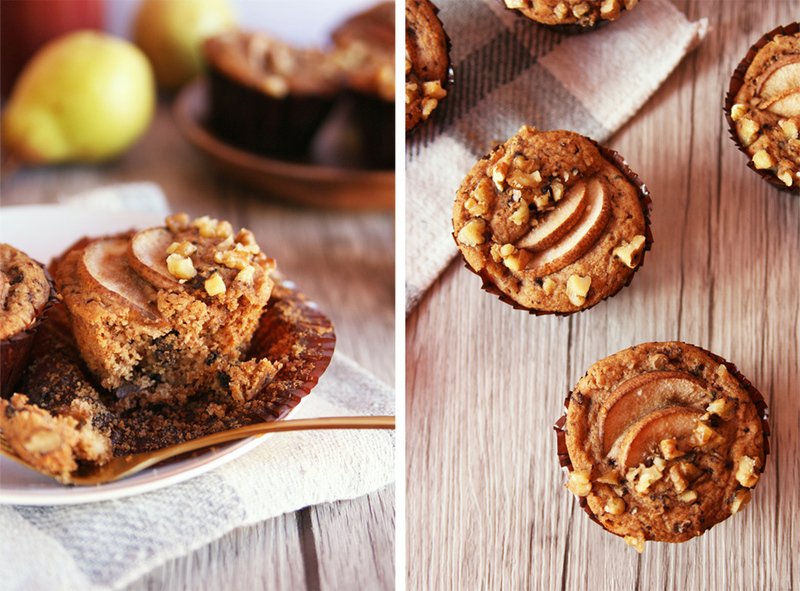 The photos make me want to run into the kitchen to whip up a batch right this instant!